Marcel Braun brought A Starship in Every Garage, a team of glass artists, to The Sculpture Garden in Philadelphia to create a glass coins from scratch to be used as currency among glass collectors. Marcel works on a cake-like piece of glass is pulled down into long cane. That cane is then cut and worked into a particular coin. Last week, a starship made its way from Eugene, Ore., to North Philadelphia, where its crew members turned a 40-pound, 3,000-degree hunk of borosilicate glass into an alternative, coin-based form of money known as Art Units. To its creator, that form of currency represents a way out of our traditional economic system. "Piloted" by longtime glass artist Marcel Braun, the so-called Starship is a group of glassmakers who create the glass coins. It takes its name from Braun's compound in Oregon. After months of preparation, Braun and his crew, also known as "A Starship in Every Garage," worked with Old City's Ruckus Gallery to come to Philadelphia. On Friday, they gave a demonstration at the Sculpture Courtyard. Braun and a crew of about 10 made an Art Unit for Philly. Finished outdoors in the dark and rain around 3 a.m. Saturday, the coin reads "Ruckus Presents 7.10 Art Units for the City of Brotherly Love." With that, Philly became part of what Braun, 41, calls the "sacred economy" of the Art Unit — an economic system that focuses on community success rather than individual wealth. Braun's Art Units are not the first alternative money of their kind. In economic terms, they're "community currency," a type of money often focused on a geographic region. Examples include Ithaca Hours in Ithaca, N.Y., COjacks in Colorado, Eugene Skinners in Eugene, Ore., and BerkShares in Massachusetts. Art Units are similar but focus on glass collectors as an interest group, specifically those based in the glass pipe movement, in which Braun made his a name over the last 20 years. "The Art Unit is a piece of art, like the Mona Lisa downsized into little inch-by-inch coins, and it's backed up by the art itself," says Jessica Boggs, 38, Braun's significant other, mother of their child, Phoenix, and member of the crew. "It's kind of like a gold coin, but it has work and energy in it instead of a precious metal." The Ruckus event was the first of its kind for the Starship, in which Braun and his team created an Art Unit from start to finish. The unit was later cut and polished into individual coins at a glass studio run by Katie Severance, Jocelyn Beaucher, Patty Clune. They will be released to the public on Wednesday at Ruckus Gallery, along with an an exhibit explaining the production of the coins. Bearing heady messages like "Art Seeds Dreams" and "An Alternative Is Possible," Art Units began in 2013 as an extension of Braun's Project 33. More a philosophy than an art project, Project 33 focuses on "mutual support," Braun said, and involves everything from growing your own food to creating an alternative economy. Art Units are among its most ambitious directives, and are created by a variety of artists on a volunteer basis. "Each Art Unit is $10, so in terms of what it's worth, it's measured by the amount of resources and community energy and skill that goes into the creation of the coin," says local filmmaker Dan Collins, director of Project 33: An Alternative Is Possible, a free documentary on Vimeo about Braun's project that was screened at Friday's event. "Essentially, it's meant to serve as a form of barter that removes the glass community from the burden of using U.S. dollars and buying into the banking system." About 40 Art Unit editions have been produced. Denominations range from 3.3 to 100, meaning the coins have a face value of between $33 and $1,000. Coins have been created to help various charities and individuals; others — those marked with an infinity symbol — are intended as gifts. Sales are handled primarily at A Starship in Every Garage's Instagram page. Several glass-related suppliers, distributors, and artists accept the coins as partial or full payment for items from raw glass and tools to finished pipes and art pieces. Some West Coast marijuana dispensaries have agreed to accept Art Units as payment, and the Starship has used them to pay for tree cutting and IT services, as well as for an Airbnb, Boggs says, though he acknowledges they have a way to go before being considered the next Bitcoin. As art objects, the units themselves are glass murrine, commonly known as millefiori or "millie." The term describes a glassblowing technique that produces decorative patterns that was popularized by Venetian glassmakers in the 1500s. Today, millies are collectible, regularly fetching hundreds, even thousands, of dollars. 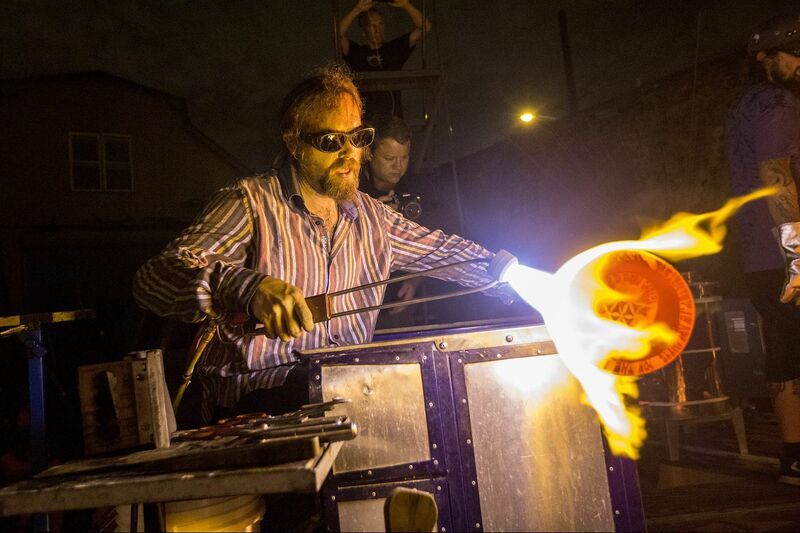 Philadelphia has become notable in the glass pipe movement over the last decade, thanks to artists like Marble Slinger, Germ, and Snic Barnes, as well as to its proximity to South Jersey, where much of America's early glass industry developed. The National Liberty Museum highlighted glass pipe artists last year with its "Treachery of Images" exhibit, which included glass pipes valued at as much as $250,000. The once-vilified glass pipe is becoming as legitimate — and expensive — as art that you can't smoke weed out of. Braun's most elaborate pipes typically sell for tens of thousands of dollars. He studied under major glass artists, including Pino Signoretto, Emilio Santini, Roger Parramore, and Brian Kerkvliet. In the words of Project 33 partner and fellow pipe artist Matty White, Braun "has the skills to mega-pay bills." "He's an artist who found pipes as a way to make a living and used that opportunity to pursue loftier artistic goals that go way beyond the pipe," Collins, who also edited the 2011 pipe doc Degenerate Art, says. "Creative minds are going to move into new territory, and I think that's what we're seeing here." Braun is also creating equipment. Ruckus Gallery director Jocelyn Beaucher, 22, says the project is revolutionary. The two major types of glass are soda-lime, or "soft glass," which is used in decorative pieces, and "hard," or borosilicate, glass that has historically been used in science and industry and that requires much more heat to work with. Soft glass is often worked in furnaces in large, expensive studios; borosilicate is usually worked on torches and can be done relatively cheaply. Braun takes soft glass techniques from the studio glass movement and applies them to borosilicate, his usual medium, for his Art Units. As a result, he and the Starship crew have had to develop new tools, equipment, and processes. "There is not a human being out there doing this besides them," Beaucher, who organized the event after a trip to the Starship in Eugene, says. "People in the glass art world, rather than just the pipe scene, are paying attention, and that's important." The project could help break down the wall between traditional glassworkers and glass pipe makers, who have historically been at odds over the pipe industry's association with marijuana. But as legalization has spread, cannabis has become more socially permissible, as has the paraphernalia, and, in turn, the artists who make it. The Sculpture Courtyard event was an unusual practice in glass working, which is is highly competitive and typically involves secretive processes. But Braun lets it all hang out in a kind of open-source gesture to anyone interested, as well as a way to educate audiences about the Art Unit project. When Braun and his Starship landed in Philly, they came with a full shop in tow, equipment ranging from specially designed furnaces and kilns to glassblowing torches and tools, as well as polishing equipment. Also included was a stage for manufacturing the Philly coin, the debut of the Starship's traveling incarnation. Thank you to everyone that came out on Friday evening! We enjoyed showcasing @astarshipineverygarage speacialty coin pulling process. Shouts out to our Gallery Director @jaybooshay for putting this event together and a HUGE thank you for all of the hard work on the Starship's end to make this dream possible. We can't wait to reveal the coin at our Coin Release Party this Wednesday at 6 p.m! Repost @jaybooshay - I can't even begin to express the joy of being able to watch @astarshipineverygarage work, this team is absolutely unstoppable in every single facet of their process and furtherment. From a 48 hr drive from Eugene, Oregon to the city of brotherly love, then straight to an intensive demonstration gaffed by @marcelglass accompanied by @mattywhiteglass @jasongordon315 @odo_glass @uknowshaun @glassmunky my heart is just so full. Thank you so much for coming out to Philadelphia and allowing me to help put together this showcase for you all - Can't wait to release what the team made on Wednesday at Ruckus Gallery @ruckusgallery for our Coin Release Party! Stop by 6 to 9 p.m! "This is definitely glassblowing Special Forces stuff," said glass artist Josh Chiodo, 33, Marcel's assistant, also known as Odo Glass. Braun and the Starship crew have created coins at glass industry events like East Coast Melt in the Poconos, Michigan Glass Project in Detroit, and the Degenerate Flame Off in Portland, Ore., but never from start to finish as in the Philadelphia demo. Braun hopes to build his touring equipment and take it to other cities. He said he hopes to see it evolve into a multiday festival that revolves around making a new Art Unit wherever the Starship touches down. Braun also hopes to increase Art Unit edition sizes, which currently supply around 100 coins per pull. The Starship has not kept track of how many Art Units exist, which Braun admits is a mistake. The project, he says, will one day need to take on official employees, like bookkeepers, but is limited by funding and manpower. Though they're making a form of currency, Braun says he and the Starship crew aren't getting rich off Art Units and typically make only enough to recoup costs and funnel proceeds back into the project. The main criticism of the project, Braun says, is that Art Units, despite his efforts, probably won't become a form of money. But what matters to supporters of the project is that Braun is at least making an attempt to get people out of the current economic system. "That's all it takes, that one person standing up," Chiodo says. "In the movies, you see one person stand up and start clapping. I think Marcel is that first goofy b-, going, 'Let's start clapping.' "